The Women’s National Democratic Club held a forum for Democratic candidates for D.C. Council one month before petitions to appear on the June 19 primary ballots were due. Here is some of what candidates had to say about affordable housing. Jeremiah Lowery suggested re-thinking the use of Area Median Income to determine what housing prices qualify as “affordable.” He said the topic was personal for him because his family is native to the D.C. area and his mom had been in foster care and experienced homelessness. “We need to hold some of these big developers accountable,” Lowery said. He talked about expanding child care and strengthening rent control. Marcus Goodwin, a native of Columbia Heights said he has “stood against” landlords as long as he could. He said D.C. should require more square footage in apartments and more three- and four-bedroom units. “I want to live in a city where my grandparents can age gracefully,” Goodwin said. He suggested implementing recommendations from the 2017 D.C. Women’s Needs Assessment Report to address domestic violence. 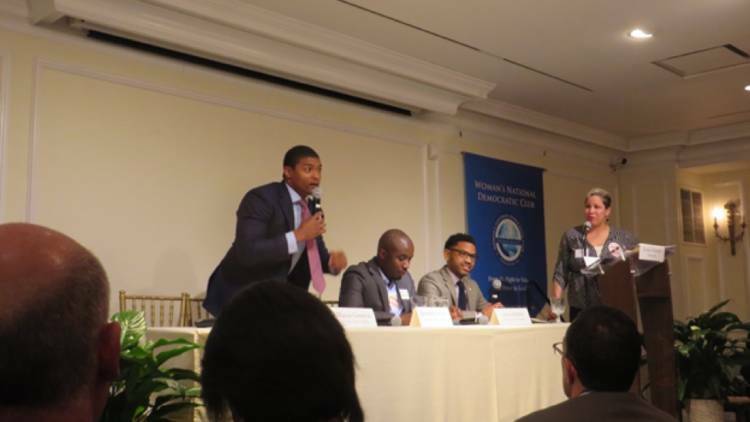 Aaron Holmes participated in the forum but will not be on the June 19 ballot after Lowery questioned some of his petition signatures and the D.C. Board of Elections upheld the challenge. Holmes endorsed “redefining affordability” and “investing in indigenous residents.” Holmes may proceed as a write-in candidate. Phil Mendelson highlighted his record on rent control and rental assistance. He said no one is adequately addressing jobs. ”If you want the city to be affordable, people have to get jobs and part of them getting jobs is educating them, which we’re failing to do,” Mendelson said. Mendelson said the chair of the council must be someone who can manage colleagues, get majority votes through and be a check and balance on the mayor. He described supporting Mayor Bowser’s 2016 proposal to replace D.C. General family shelter with smaller facilities throughout the city but objecting to the proposed approach to financing, leading D.C. Council to find another way to pay for the plan. Ed Lazere said, “We should measure our success by how much we are reducing the racial inequalities; that means investing more in affordable housing.” He wants to double affordable housing investments, including home ownership programs and spend some of the $2.4 billion surplus savings to preserve public housing. Lazeere stressed the need to allow residents who are relocated because of redevelopment to return to their public housing in a timely manner. Calvin Gurley participated in the forum, but will not be listed on the June 19 ballot after some of his petition signatures were questioned and the D.C. Board of Elections upheld the challenge. Gurley supported public housing, stating it could support underemployed graduates burdened by student debt. While both Mendelson and Lazere acknowledged the vast income and wealth disparity between Black residents and White residents, Gurley called for Reparations. He criticized D.C. Council for inadequate oversight of the District government and had concerns with the Housing Production Trust Fund, the Office of the State Superintendent for Education and the Metropolitan Police Department. Gurley may proceed as a write-in candidate.